The following keys are provided with vehicle, vehicles without a smart key system (type A), operating the wireless remote control function (P, vehicles without a smart key system (type B). Vehicles with smart key system, *: This setting must be customized your Toyota dealer, using the mechanical key (vehicles with smart key system), to take out mechanical key. Push the release button take, the mechanical key can only be, key only has grooves one side, lock cylinder, turn it over and reattempt insert it. After using the mechanical key, store it in the electronic key, mechanical key together with the electronic key,  Vehicles without smart key system, about one second, an alarm will sound. Intermittently and vehicle lights will, flash to deter any person trying, break into damage your vehicle, to stop the alarm, press any button. When required to leave the vehicle's key with parking attendant, lock the glove box as circumstances demand, vehicles without a smart key system: Carry the master key your own use, and provide the attendant with valet key. Vehicles with a smart key system: Remove the mechanical key your own, use and provide the attendant with electronic key only, if you lose your keys, new genuine keys can be made by your Toyota dealer using other key. (vehicles without a smart key system) or the other mechanical key (vehicles, with a smart key system) and the key number stamped your key number, when bringing a key with wireless remote control function onto an aircraft, make sure you do not press any button on the key while inside aircraft. Not likely to be pressed accidentally, emit radio waves that could interfere with the operation aircraft,  Vehicles with smart key system, the wireless remote control function may not operate normally following situations. ● When the wireless key battery depleted, ● Near a TV tower, electric power plant, gas station, radio station, large display, airport or other facility that generates strong radio waves electrical, ● When carrying a portable radio, cellular phone or other wireless communication devices, ● When the wireless key is in contact with, or is covered by metallic object. ● When other wireless key (that emit radio waves) being used nearby, ● If window tint with a metallic content or metallic objects attached, if the wireless remote control function does not operate, battery may be, ● The standard battery life is 1 2 years. ● If the battery becomes low, an alarm will sound in the cabin when engine, depleted even if the electronic key is not used, the smart key system or the wireless remote control does not operate, the detection area becomes smaller. ● To avoid serious deterioration, do not leave the electronic key within 3 ft, m) of the following electrical appliances that produce magnetic field, cellular phones, cordless phones battery chargers, recharging cellular phones cordless phones. 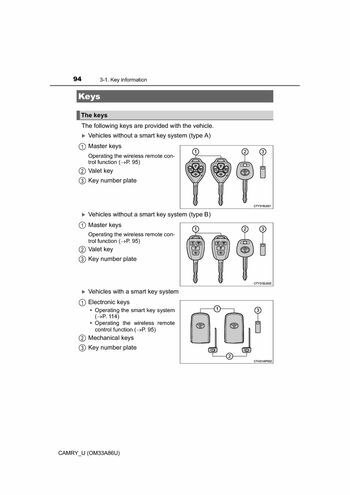 Confirmation of the registered key number (vehicles with smart key, the number of keys already registered to the vehicle can be confirmed, the key cylinder rotates freely isolate inside mechanism.